Trail volunteers from AMC's Delaware Valley Chapter can be spotted throughout the Valley from the Appalachian Trail to Valley Forge National Historical Park. Some of them may have yellow paint on them! Ewok Village is the name of a set of tree and stone structures built on AT National Park Easement Lands slightly east of Little Gap, Pennsylvania. This is on lands maintained by AMC Delaware Valley. The structures were removed in May of 2008 and then mysteriously rebuilt. 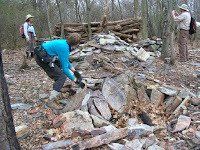 They were removed again on National Trails Day, 2009, hopefully for good. September 4 to 7. Joint project with ATC to improve water drainage on the Katellen Trail. Katellen trail is mostly on State Game Land (SGL), with a small section on State Forest Land. 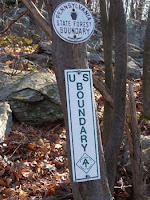 It is a straight spur up to the Appalachian Trail from a SGL parking area. October 17. AMC-DV hosted Pamela Underhill, the head of the Appalachian Trail National Park, on a tour of parts of the AT corridor near Smith Gap. Corridor maintainers from other Pennsylvania and New Jersey clubs attended. This was Ms. Underhill’s first visit ever just to see corridor boundaries work and discuss problems with this undertaking. In late May of this year Mike & Kieu Manes (avid trail volunteers)were hiking the AT in New Jersey and stopped to chat with a young couple that were thru hiking. The female member of the young couple appeared complete disinterested in any discussion until she heard mention that we maintained the Leroy Smith Shelter. A fit of excitement hit her, she had to tell us how nice and clean our shelter was, and that we had an adequate supply of toiler paper. She thanked them many times, and informed them that Leroy Smith Shelter is known as one of the best maintained lean-tos. This was confirmed by other thru hikers twice on later occasions, but never as dramatically. 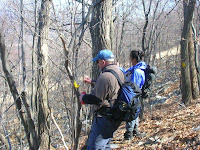 Give back to trails in 2010 by getting dirty and having fun! 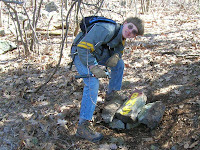 Hit the trails either on the AT, in Valley Forge NHP or in Nockamixon State Park. Valley Forge National Historic Park We are working the park to re-hab and maintain trails in the Mount Misery and Mount Joy areas of the Park. If you are interested in helping this project along, pleasesend email with your contact info to Mark Kern, bikermjk@amcdv.org or call him at 610-558-9628. Nockamixon State Park. 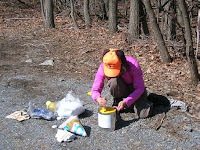 We are currently maintaining about 3 miles of trail in Nockamixon SP (near Quakertown, PA). If you'd like to help work on trails in this park, call Peter Jarrett, 610-282-4635.